Advocates for change to this Coldstream stretch of the Maroondah Highway welcome a cash boost. A $20 million project will bring two sets of traffic lights to Coldstream and duplicate part of the Maroondah Highway. Prime Minister Scott Morrison announced a $121 million investment in congestion-busting infrastructure on Thursday 7 February. 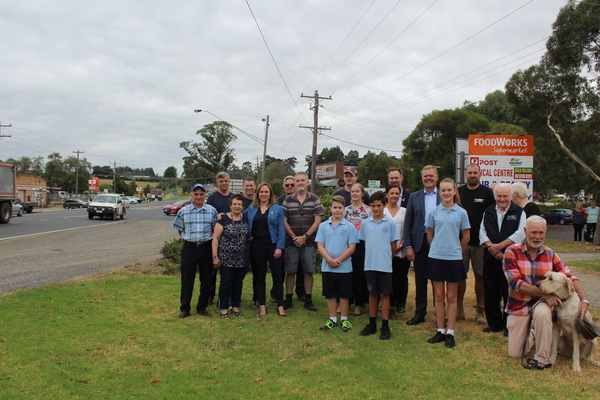 Casey MP Tony Smith visited Coldstream on Friday to celebrate the Coldstream project with locals who’ve been campaigning for change. “Maroondah Highway is the key gateway to the Yarra Valley,” he said. 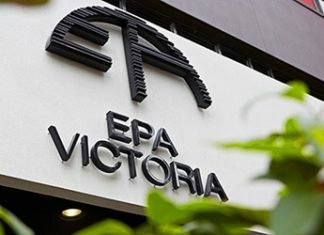 Mr Smith said he’d worked closely with Yarra Ranges Council to devise the “state-of-the-art fix” for safety and congestion concerns, particularly the council’s environment and engineering director Mark Varmalis. “With the material Mark’s put together I’ve been able to argue very strongly with government ministers that this is a priority,” he said. The duplication will extend from the Melba Highway to Ingram Road. The traffic lights will be installed at the Killara Road-Station Street intersection and the Gateway estate entrance. “The road will be safer. Everyone will benefit,” Mr Smith said. He thanked the locals who gathered at Killara Road on Friday for putting their voice to the issue. He said consultation and planning would start in the near future. Yarra Ranges Mayor Tony Stevenson kept his words to Mr Smith short and sweet. “Thank-you for listening. Thank-you for acting,” he said. He said Ryrie Ward councillor Fiona McAllister had been a pleasant but persistent voice on the topic. “It has been a long conversation,” she confirmed. She said exiting Killara Road or Station Street on a weekend could take up to 20 minutes, and said Coldstream Fire Brigade – located on Killara Road – had been a strong voice alongside traders and residents. Evelyn MP Bridget Vallence said during last year’s election campaign that a Liberal State Government would fund the project. She said she couldn’t get a pledge across the line from the Labor State Government. Local Malcolm Rickarby said the announcement was fabulous. “But this is not the worst bottleneck in the district,” he said. He and several other locals said the duplication should extend to the Warburton Highway. Coldstream CFA captain Sean Bethell said he was extremely pleased that the project was actually going ahead. “It’s going to help the brigade and the community to get access in and out of these streets,” he said. He said vehicles waiting to turn right onto Maroondah Highway clogged the network, so often resorted to turning left and performing U-turns. “With this happening between the Melba Highway and Ingram Road, I hope the State Government will fund the rest to Warburton Highway,” he said. Coldstream Voice’s Kevin Ryan collected thousands of signatures on a petition that was presented to State Parliament last year. He said 17,000 vehicles used the stretch every day.